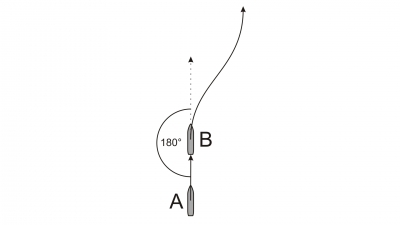 Applying the Rule(s) and comments: In accordance with Rule 13 (b) (Overtaking situation), a vessel (vessel A) shall be deemed to be overtaking when coming up with another vessel (vessel B) from a direction more than 22.5 degrees abaft her beam. In accordance with Rule 13 (a) (Overtaking situation), notwithstanding anything contained in the Rules of Part B, sections I and II, any vessel overtaking (vessel A) any other vessel (vessel B) shall keep out of the way of the vessel being overtaken (Vessel B). In accordance with Rule 13 (d) (Overtaking situation), any subsequent alteration of the bearing between the two vessels shall not make the overtaking vessel (Vessel A) a crossing vessel within the meaning of these Rules or relieve her (Vessel A) of the duty of keeping clear of the overtaken vessel (Vessel B) until she is finally past and clear. In accordance with Rule 17 (a)(ii) (Action by stand-on vessel), the vessel which shall keep her course and speed (vessel B) may take action to avoid collision by her manoeuvre alone, as soon as it becomes apparent to her that the vessel required to keep out of the way (vessel A) is not taking appropriate action in compliance with these Rules. In accordance with Rule 17 (b) (Action by stand-on vessel), when from any cause, the vessel required to keep her course and speed (vessel B) finds herself so close that collision cannot be avoided by the action of the give-way vessel alone (vessel A), she (vessel B) shall take such action as will best aid to avoid collision. 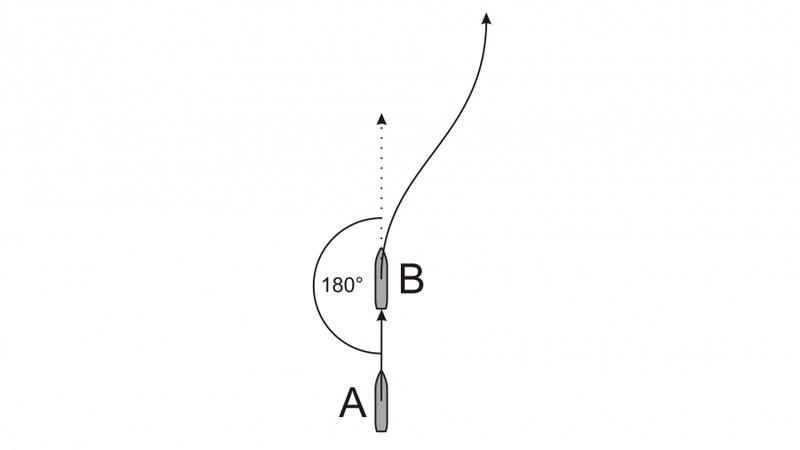 In accordance with Rule 17 (d) (Action by stand-on vessel), Rule 17 does not relieve the give-way vessel (vessel A) of her obligation to keep out of the way. Register to get free access to bird's-eye, bridge, radar and/or ECDIS view videos!